Hyderabad Vs Gujarat Elite Group B Ranji Trophy Cricket Match is an event that took place between 09-Dec-2006 and 12-Dec-2006 in Hyderabad. There's a Ranji happening in town. Our guess is that the CM will be here - "Ranji" has 4 letters in common with "Rajiv". The third round of the Ranji Trophy Elite Group B match between Hyderabad and Gujarat will be played from 9th to 12th of December, at the Rajiv Gandhi International Stadium in Uppal, under the management of the Hyderabad Cricket Association. With the Gujarat team looking weak under ex-Indian wicket-keeper Parthiv Patel, Hyderabad, with the advantage of playing in home conditions, will be going for an outright win. With the next three matches, also at home, against stronger opponents like Mumbai, Bengal and Punjab, Hyderabad would like to garner full points from this match. With four points from the previous two outings against Maharashtra at Karad and Rajasthan at Jaipur, Hyderabad has done reasonably well this season. The in-form batsmen like skipper Anirudh Singh, A T Rayudu, Ravi Teja, D Vinay Kumar and Arjun Yadav, have all got runs, whereas in the bowling department Pragyan Ojha, Narendrapal and Kaushik Reddy have struck vital blows in the opposition camps, helping Hyderabad in gaining the first innings lead in both the occasions. On the other hand, Gujarat, with the exception of their captain Parthiv Patel, have had a bad patch, with neither the batsmen nor the bowlers able to put up a good show. They are at the bottom of the Group B table, with no points from their two matches. For further details, please contact Hyderabad Cricket Association at 2790-5676. 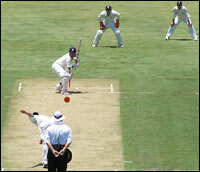 Be the first to comment on Hyderabad Vs Gujarat Elite Group B Ranji Trophy Cricket Match! Just use the simple form below. fullhyd.com has 700,000+ monthly visits. Tell Hyderabad what you feel about Hyderabad Vs Gujarat Elite Group B Ranji Trophy Cricket Match!